The spotted wing drosophila is an invasive pest from Asia, first discovered in California in 2008. It was discovered in western Washington, Oregon and British Columbia in 2009, and in eastern Washington in June of 2010. Detections were made for the first time in Utah and Michigan in late summer/fall of 2010. It is fairly widespread in Florida, and detections have been made in North and South Carolina. It has been established in Hawaii since about 1980. A common theme of spotted wing drosophila spread in the US is a single detection, followed by intensive trapping, followed very quickly by detection over a broad geographic range. The current known distribution in eastern Washington (as of August 2010) is from the Canadian border to the Tri-Cities. 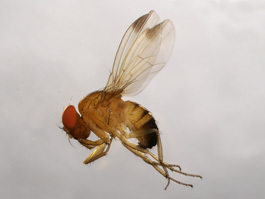 Spotted wing drosophila differs from the common drosophila (Drosophila melanogaster) in that it can attack undamaged fruit still on the tree; the common species will only attack damaged, overripe, or dropped fruit. Because of the relatively recent nature of this introduction, information in this article is subject to change as we learn more about the biology of this pest in our region. Almost all of the information contained herein is taken from other sources. Sweet cherries are currently the tree fruit host of greatest concern in eastern Washington. Other recorded temperate tree fruit hosts include peaches, plums, pluots, and nectarines. Grapes (wine, table, juice) are well-known hosts. Berries are also favored hosts, including blueberries, blackberries, marionberries, raspberries, and strawberries. Other recorded hosts are figs and kiwis. While apples and pears are included in some host lists, the economic risk to these crops has yet to be established. 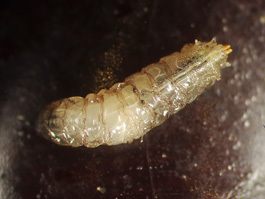 Eggs are translucent white, elongate, and about 0.6 x 0.18 mm. They are laid in the flesh of the fruit. There are a pair of “breathing tubes” attached to one end of the egg; these protrude from the puncture made by the female’s ovipositor and are visible as white threads on the surface of the fruit. These are frequenly fused at the tips, giving the appearance of a single thread. 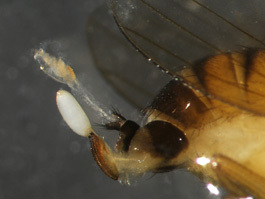 Fully grown larvae are typical Drosophila larvae, with black mouth hooks at the front end, and a pair of disctintive tan caudal spiracles at the rear end. The caudal spiracles, along with the prothoracic spiracles, can be used to differentiate the larvae of Drosophila from the larvae of cherry fruit flies (tephritids). 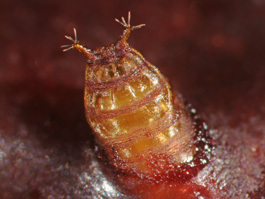 There are three larval instars, with the last instar about 4 mm long. 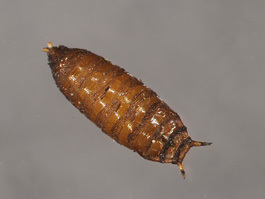 Pupae are medium brown with two distinctive structures at the anterior end, resembling the prothoracic spiracles. Pupae are about 3 mm in length, with females slightly larger than males. Adult: The adults resembles Drosophila melanogaster except for a few distinguishing characteristics. Overall the adults are about 3 mm in length, with a tan body and red eyes. There are 1 pair of wings, plus the halteres common to the Diptera. The abdominal segments have dark brown bands on the posterior edge. The key character of female D. suzukii is their heavily sclerotized and serrated ovipositor, which is lacking in D. melanogaster. The key character for the males is the single spot on each wing, from which the species gets its common name. The spots are on the leading edge of the wing near the tip. However, it should be noted that the spots are not visible when the adult male first emerges; it takes 8-10 hours for them to be fully formed. An additional characteristic of the males are the dark bands encircling the forelegs. 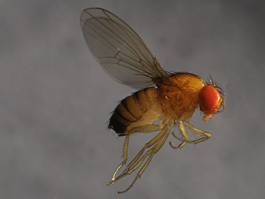 More details on spotted wing drosophila are available from Oregon State University: http://spottedwing.org/. The short term life history is typical of an insect that can reproduce quickly, and produce succeeding generations in a short amount of time as long as a suitable host is present. The seasonal life history in eastern Washington has yet to be established. Overwintering in this region is suspected, but not confirmed. Overwintering has been confirmed in mild-climate areas such as California, temperate regions of Oregon, and western Washington. A theoretical distribution map of spotted wing drosophila indicates that much of eastern Washington is classed as either “marginal” or “unsuitable” for establishment. The experience of 2010 is that even if this species does not overwinter here, seasonal re-invasion may give essentially the same management scenarios. The following life history parameters are taken from the original 1939 study by Kazawa. Up to 13 generations/year were recorded. These studies also indicated that the time from egg to adult was 8-11 days under optimal temperatures, which are about 77°F; The egg stage lasted from 1-3 days, the three larval stages 3-13 days, and the pupae 4.5 days. Development was proportionately slower at 60°F. The life cycle in the field during the cherry season is expected to be about 2-3 weeks. Adults can live 3-9 weeks, although the adults that overwinter live for many months. The females lay from 1-60 eggs per day, averaging about a dozen (when all generations are included). Total lifetime fecundity of the females is 200-600 eggs. Spotted wing drosophila prefers a moderate climate, such as that found in the coastal areas of the west; however, recent experience has shown that is will also become established in hot-summer/mild winter areas such as California’s central valley. Activity is suppressed by high summer temperature (110-115°F), but resumes when temperatures drop off in the fall. Damage is caused by oviposition by the females, and larval feeding in the fruit. Fruit becomes soft, and subject to decay. The initial oviposition site takes on a sunken appearance. After larvae become larger, they cut breathing holes in the side of the fruit, further enhancing the opportunity for decay. While much remains to be learned about the potential for damage, experience in various regions and crops indicate that fruit infestation levels can become very high in a short amount of time. High risk scenarios are pollenizer varieties left unharvested, and organic fruit. Because is it already widely distributed in the US, there is no internal quarantine on this insect. To date, only two countries to which Washington exports cherries have imposed quarantine restrictions (Australia and New Zealand). However, it is clearly a food quality issue. The adult flies can be monitored using bait traps. Many different trap styles and bait mixtures have proven to successfully attract the adults (both males and females). At this point, an argument can be made for the simplest, most easily handled trap and bait system rather than one catches the maximum amount of adults. Traps can be readily fabricated with cheap, easily available materials. A clear plastic cup with a lid and holes punched in the sides, is a very effective trap. More expensive, rigid containers (e.g., nalgene bottles with screw caps) with the same general configuration will also work. The rigid trap bodies and screw caps are easier to handle and transport, and provide less risk of spills. There are several styles of commercial bait traps that have been used successfully, e.g., the McPhail trap. 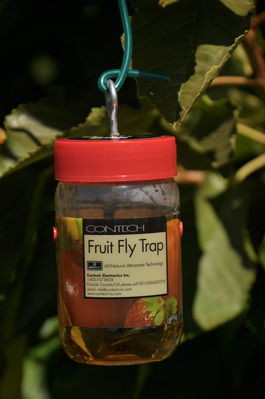 A dedicated fruit fly trap (Contech Inc.) is available for purchase; this trap style has been used successfully in trapping throughout eastern Washington in 2010. Its efficiency relative to other trap types is unknown, but it is sufficient for detection monitoring. A number of bait mixtures have been tried, and tests are still ongoing. Attractive ingredients include apple cider vinegar, red wine, and yeast; various combinations have been tried. Apple cider vinegar is easily obtainable in large quantities, and appears to be a reasonably effective bait, although others may be more highly attractive. (NOTE: do not use white vinegar, or apple-flavored white vinegar). The bait chosen will probably depend on the objective of the trapping program (detection versus detailed biological studies). Unlike pheromone capsules or dispensers which are designed to last for weeks or months, baits need to be changed regularly, at least weekly. When changing the trap, remove all the bait and captured flies, and replace with fresh bait. 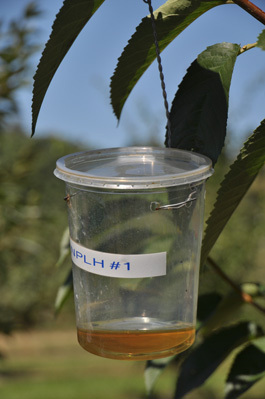 If using a trap with a screw-on lid, then top can be left in position in the tree, and the entire jar replaced with one containing fresh bait. In any case, do not “top up” the trap with fresh vinegar. Placing a strip of white or yellow sticky card in the trap may help prevent flies from escaping once they have entered the trap; however, it means there is an additional piece of material to handle, examine and change each week. Traps lacking these sticky cards have caught spotted wing drosophila regularly, and the apple cider vinegar only system is quite effective. Little is known about biological control of this pest. While it likely has a number of natural enemies, these will be unlikely to thrive in a sprayed orchard. To date, the only method of preventing damage by this pest is full coverage sprays. 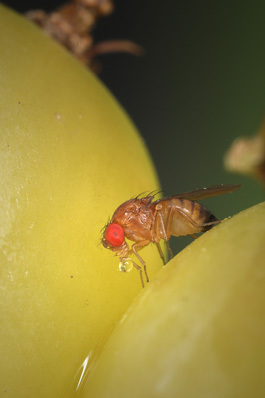 The bait sprays that have worked so well for western cherry fruit fly are currently NOT effective against spotted wing drosophila. The bait system works on western cherry fruit fly (or other Rhagoletis species) because of the biology of the females; they have a ca. 10 day pre-oviposition period after they emerge where they feed in order to mature their eggs. No such behavior is known for spotted wing drosophila. Even if the adults are attracted to (and killed by) the bait, it may not provide protection against this pest. Current recommendations are to place traps in the orchard well before fruit begin to ripen; about straw color on cherries. Traps should be checked at least weekly. The provisional threshold to trigger a spray is the capture of a single adult; this may change in the future as we gain a better understanding of active area of the traps and economic thresholds. If the crop has not been harvested, then a protective schedule of full coverage sprays is needed to prevent fruit infestation. If the crop has been harvested, or left unharvested due to condition or markets, post-harvest sprays targeting both adults and larvae in the fruit should be applied. Pesticides, for either pre- or post-harvest use, have not been rigorously tested in eastern Washington. Information developed on sweet cherries in California and Oregon should serve as a guide in the meantime (see Other Resources below). One distinction needs to be made regarding the host list. The first category of hosts is that of whole, undamaged fruit that are attacked. This is the category which is novel for this Drosophila species. However, the second category are those hosts that attacked when they are dropped or damaged, much in the manner of the common fruit fly. 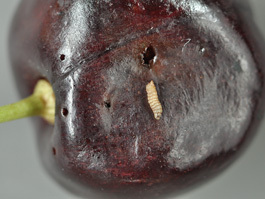 These hosts may not require preharvest protection, but dropped fruit left in the orchard could serve as a breeding site after harvest, allowing large populations to build up. These populations may then be available to attack other host crops in the area. Kanzawa, T. 1939. Spotted wing drosophila. Translated from Japanese by Shinji Kawai, tables prepared by Hannah Goodwin and Jana Lee. Walsh, D. B. Bolda, M. P. Goodhue, R. E., Dreves, A. J. Lee, J., Bruck, D. J., Walton, V. M., O’Neal, S. D., and F. G. Zalom. 2011. Drosophila suzukii (Diptera: Drosophilidae): Invasive pest of ripening soft fruit expanding its geographic range and damage potential. Journal of Integrated Pest Management. 2:1-7. DOI: https://doi.org/10.1603/IPM10010.